One week left. 7 days until Santa’s big dance. And I’m so not ready. I have a long list of things left to do. Cards? Monday night. Wrap presents? Monday night. Watch a gazillion more Christmas movies? I have the next 6 days. Baking? Done and more to come. Shopping? Just a few more things here and there. Enjoy the lights, music, and candles? Ever since Nov 6th and still going strong. This next week is going to be busy and I’m going to enjoy every stressful enjoyable minute. School is in session through Wednesday, so I won’t be getting much sleep until Thursday. And I wouldn’t have it any other way. 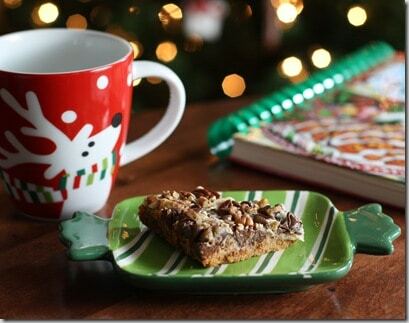 I love everything Christmas, including hot coffee, Magic Cookie Bar, and new cookbook. Stephen was off work Saturday so we decided to drive into Birmingham for some shopping. What we didn’t think about was the traffic. What the state dept. of Transportation didn’t think about was that its STARK RAVING INSANE to close two lanes of interstate, including an on ramp merging lane, so they could hang a sign. . . on a Saturday….before Christmas. On our way into the city Never mind. I am not going into detail about the suckiness of the traffic. Long story short, we were gone 6 hours and only shopped/ate for 2 of them. I could have been at home wrapping presents by the light of my candles. The last store was the grocery store. I was going in for about 4 things I needed for dinner and coffee filters. I had a big meal planned. While gripping the entrance meat display for fear the sticker shock would buckle my knees (hams were cheaper per pound than mac and cheese in a box), Stephen said “I wish we could grill steaks tonight”. I looked at him like he was crazy for about 2 seconds and then remembered his philosophy on grilling outdoors: It’s never too cold or too rainy for charcoal. Snow..maybe. So, after seeing the steaks so cheap the butchers were throwing them at random customers, we took that as the big sign that we needed to grill. We were so excited about the upcoming surge of iron in our diet, that we forgot the filters for our iron-depleting coffee. 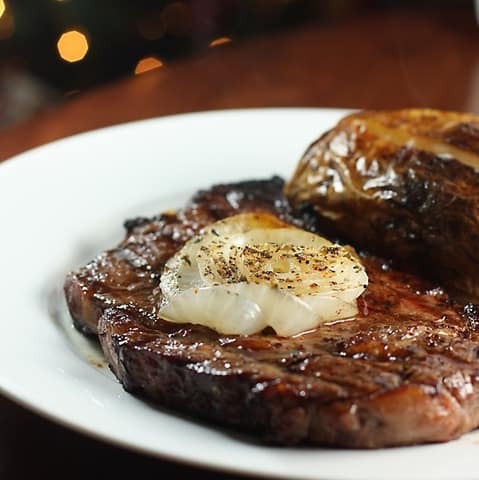 The secret to a good steak? Wood chips. Mesquite or hickory. Applewood, too. 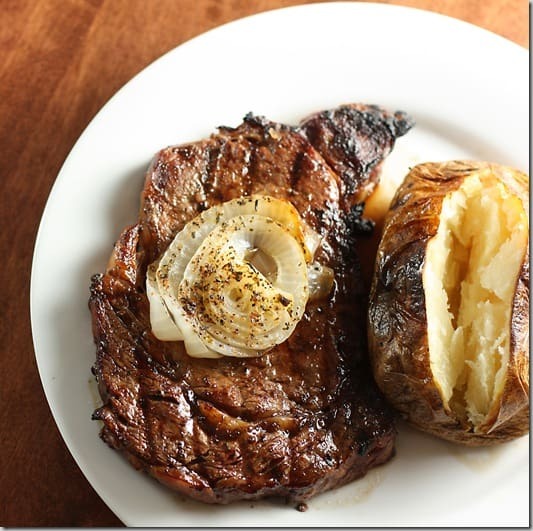 A small bowl of soaking wood chips can make a steak rise up and call you blessed. And this one did. No need for any kind of steak sauce. Marinate a half hour in Dale’s and a special blend of steak seasoning from a butcher shop in Carthage, MS.
Smoked onions with hickory salt, fresh ground pepper, and parsley. They steam in an aluminum foil pouch with butter and spices. Then he opens the pouch to get some good smoky flavor. Want your baked potatoes to be an item of poetic perfection? Pre-bake them in the microwave for 10 minutes, flipping over at 5 minutes. Then liberally scrub them, rub them, whatever with OLIVE OIL. Salt them. Wrap them in foil and finish baking on the grill 30 minutes. The oil soaks into the outer layers of the potato and gives them a great flavor and fluffy consistency. I think I found another tradition for next year. A trip to a bigger city for shopping but knowing we have a steak dinner waiting at home. I could get on board with that.